In case you've noticed that my posting on social media had gone down a bit lately, you will get the reason today. Eeeek, surprises are so hard to keep. 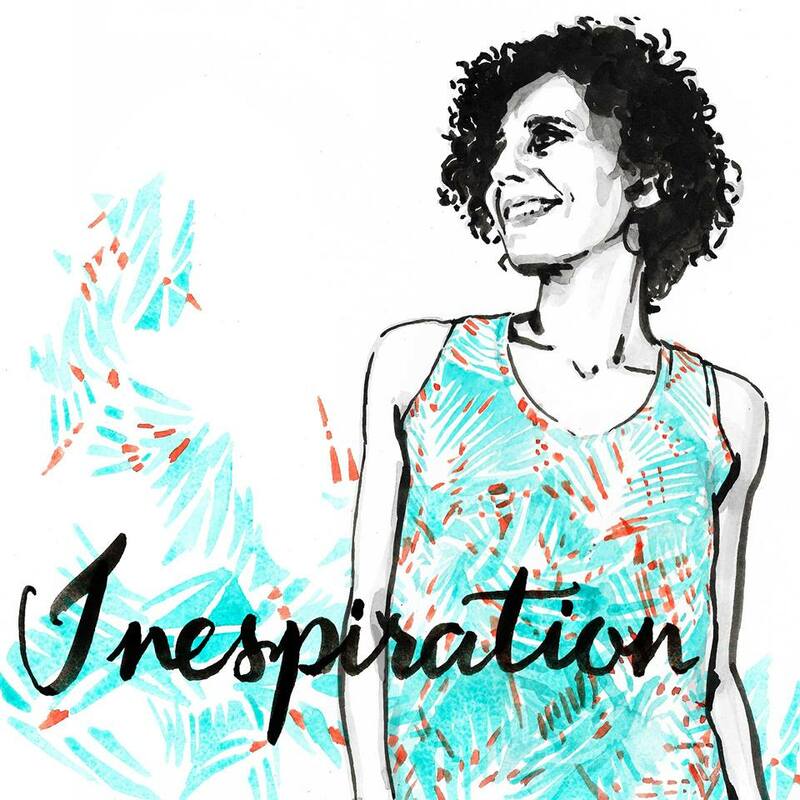 Sara has asked a bunch of bloggers to make a tribute sewing blogger day to the one and only Inês from the blog La Folie, and that was one of the easiest blog series I ever agreed to be part of. A surprise like this has, of course, to be kept as an absolute secret for the full effect. So no sneak peeks on social media. But thank you Rachel for asking the other day if everything was okay, lol. It's nice to know that someone is following you so closely that they notice things like that. Inês is one of the sweetest people around. Always full of encouragement and sweet comments. The lady is funny too and we have had many deep or lighthearted conversations via chat. I can't believe I have not meet her in real life. She feels like a real life friend. Look at this absolutely incredible illustration the ever so talented Toya has made for this series. Swoon! But not only does she have the biggest heart, she is also crazy talented. First of all I always love what she makes, both for herself and her sweet daughters. But there is often also a little surprise or detail that usually makes me want me to copy her. And today I finally get to show you a full outfit inspired by her. The top is inspired by THIS post. I loved how she turned a woven shirt dress (The Friday Dress by Petit a Petit Patterns) into a knit shirt. It was a rather small change but it looked SO different. I totally loved it. And I totally love my adult version too. 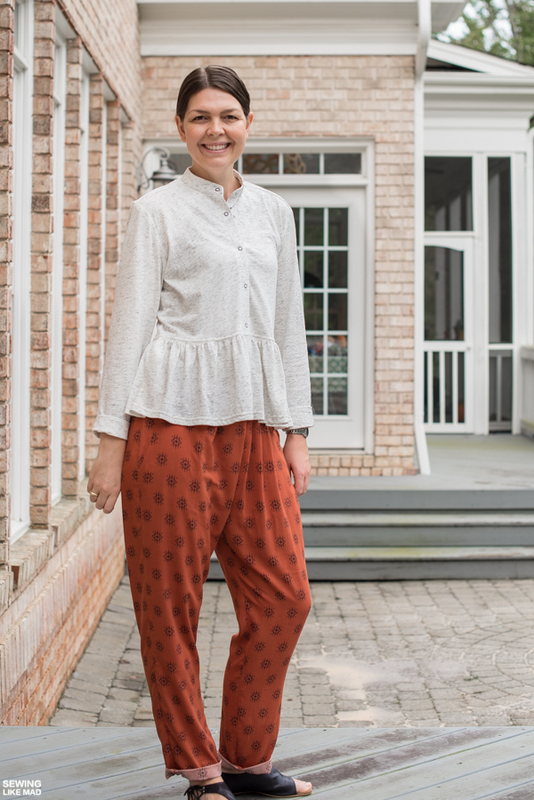 The pants are the Ebony Woven Pants by Style Arc Patterns sewn in a printed rayon. They are inspired by Inês' love for prints. See THIS post. Or THIS one. 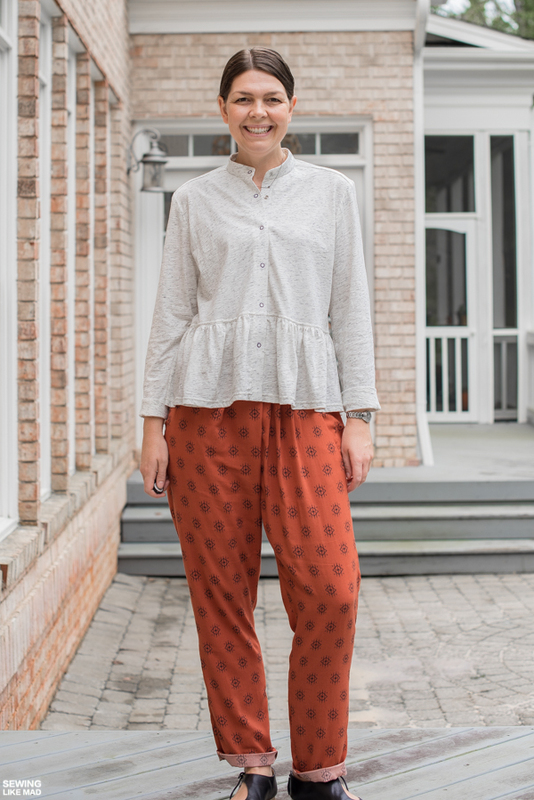 I decided to split this post up in two, so I have a whole separate post for the pants. I'm linking to it in the end of the post. Inês I hope you can recognize your style here? Since the Friday Dress is a children's pattern, I couldn't just do the same hack as Inês did. I thought the best chance of finding a suitable pattern would be BurdaStyle and that turned out to be right. 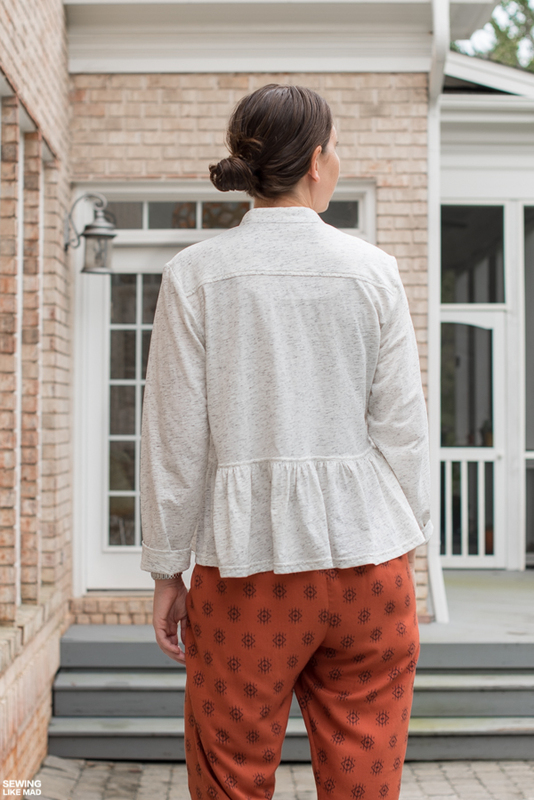 The Gathered Peplum Blouse 03/2015#109 was pretty close to what I was looking for. This was a pattern for woven fabrics but so was the pattern Inês originally used, so that did not discourage me one bit. This is actually my third version (hence the long silence on social media, ha.). The first one was the original shirt using woven cotton lawn. I did show you a sleeve placket detail shot from that one but that's it. I promise I'll show you the whole thing soon. It turned out quite well. Then the fabric I ordered for this knit version got stuck in customs, so I made another knit one, using quilted knit, as a backup. As much as I loved that one too, it turned out more like a jacket/cardigan than a shirt, so I was very relieved when my originally intended fabric made it in time and here we are, third one, phew. The fabric is HIPPU in color Vanilla from Nosh Fabrics. I have sewn with it before HERE (blue) and HERE (olive green, scroll down to second photo) and I'm slightly obsessed. It's a 100% (organic) cotton knit so there is not much stretch but there is some. It's fairly thin so that gives it a fair amount of drape. It's a pretty perfect fabric for projects like this where you are using a knit for a pattern drafted for woven fabrics. This was the obvious choice of fabric as soon as I had decided to make this project of Inês'....and that was also a pretty quick decision. I have always wanted that shirt for myself since I saw it and it was the first thing I thought of, when I heard Sara's great idea. 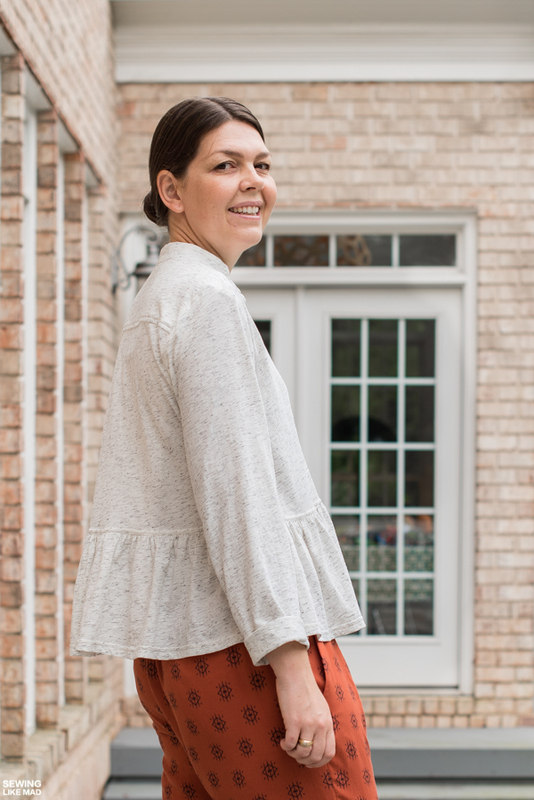 It felt particular important to sew with Nosh fabrics in this Inês tribute post because I'm pretty sure she is the reason that I even know Nosh Fabrics. Thank you for introducing me to some of the best quality knits I have ever sewn with. And yes, I am now sponsored by Nosh but I can guarantee that I would say the same if I were just a regular customer. Lastly let me give a short overview of the changes I did versus the original pattern. 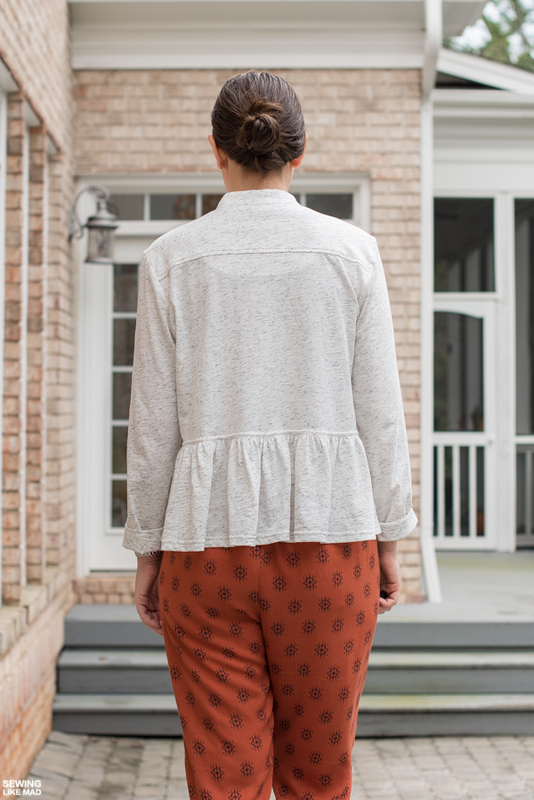 I lowered the waist seam a bit and I skipped all shirt details such as the collar, the pockets, sleeve plackets and cuffs and the back pleats. I also changed the separate front button placket to a more simple fold and stitch placket. I kept the collarband and shoulder yoke plus I used snaps instead of regular buttons. I really love how it feels like wearing a tee but it looks like a bit 'more' than that. HERE is the link to the post about the Ebony Woven Pants. You will be able to see them better in that post. I also got some general tips about Style Arc Pattern in there, so it's a good one to check out. Here are links to all their posts. They will for sure all be fabulous. I love your whole outfit and they look so great together. 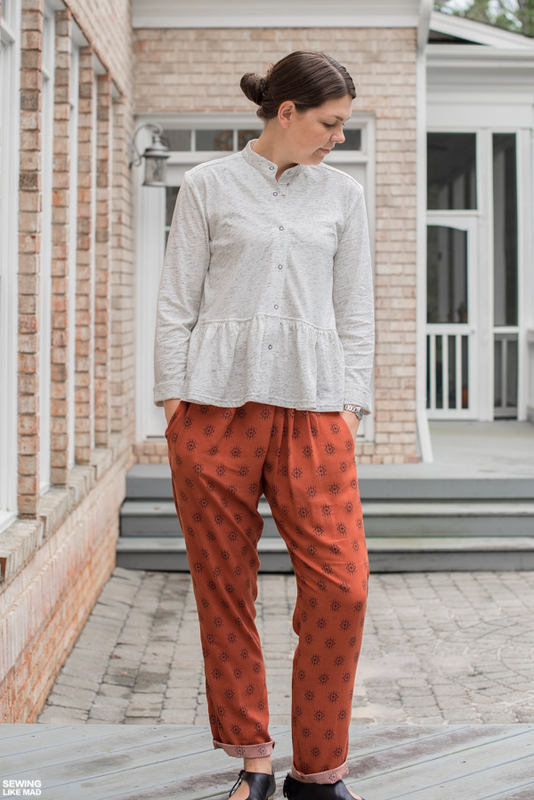 I've never made a pair of rayon pants but with that drape they look so comfortable and elegant at the same time. So awesome, my friend! I can see Ines wearing the whole outfit! It looks casual but also so chic! Just perfect! can't wait to see the other two versions! It’s a bit like the game of Chinese Whispers (I hope you know what that is lol!) with the Friday Dress. By the time it gets round to me, it’ll become a shoe 😆. My dear sewing Goddess I can't thank you enough for taking part in this surprise! This outfit is amazing and I want to copy it as quickly as possible!!! The fabrics, colours and patterns are just so my cup of tea, I'll be dreaming with it! You inspire me with every post, and I'm constantly learning and improving because of you. This is so precious that I'm out of words to describe how I feel... ❤️❤️❤️ Love you! So - first, the illustration is totally amazing! Second, I love this outfit. I feel like it has a different flavor than your usual makes (which are, of course, also always awesome!). I love both pieces and they work so well together - but would be cute separately as well. And your shoes - all the heart eyes for those too! Such a fantastic outfit. That top is so amazing and will go with so many things. I think you combined your style with Ines's perfectly.